This course describes and quantifies whenever possible the air pollution particulate emissions which are the direct result of the incineration process. The incineration process consists of burning solid, semisolid, liquid, or gaseous waste to produce carbon dioxide, water, and ash. It is an efficient means of reducing waste volume. The solid, incombustible residue of incineration is inert, sanitary, and sensibly odorless. learn about the permitting process in federally designated attainment and nonattainment areas. This course is intended for mechanical engineers, civil engineers, other design and construction professionals, and operating technicians wanting an introduction to waste incineration fundamentals. This course will give engineers and others an introduction to waste incineration and permitting requirements for incinerators. 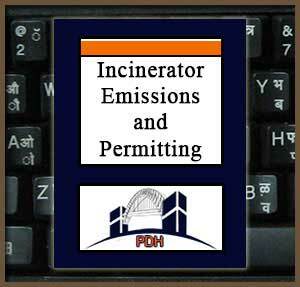 This is an introduction to the emissions technology and permitting of waste incinerators. This course will give you an introduction to waste incinerators and their permitting requirements under federal law.